ZIPP 404 Pave wheels were under Team CSC's Frank Schleck as he won the Amstel Gold Race recently. As he crossed the finish line alone at the top of the Cauberg, Schleck had this to say about his biggest win ever: "There was never time to think about winning," said a shocked and ecstatic Schleck. "Obviously, I wasn't a big favorite and I thought the chasers would catch me. Arriving at the finish line, I couldn't believe that I would actually win the race." But win he did on his ZIPP 404 Pave wheels! Built by hand on ZIPP's precision hubs, the wheels are super smooth and built to stay that way. Reinforced for the Belgiums Spring Classics in the hands of Team CSC and Schleck, the ZIPP 404 Pave will take the merciless pounding of the cobbles with ZIPP's VCLC (Visco-elastic Constrained Layer Control) technology. VCLC technology delivers a 10% reduction in vibration and muscular road fatigue no matter how fast or how long you are riding. They are the only wheels tough enough to handle Team CSC's cobblestone specialists with greater comfort, unmatched aerodynamic performance and excellent durability. Team CSC is the only team in the world to have custom built Carbon Wheels for cobbles and the pave' of Europe and ZIPP is the only carbon company to deliver the technology. 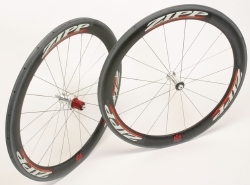 You can get them yourself to bang on rough roads like the Amstel Gold Race direct from ZIPP Speed Weaponry at www.zipp.com.